Bike Riding has become a new sport for Mike and I. We love biking on back country roads here in Texas, and over the last several years, have started renting bikes in whatever city we visit. 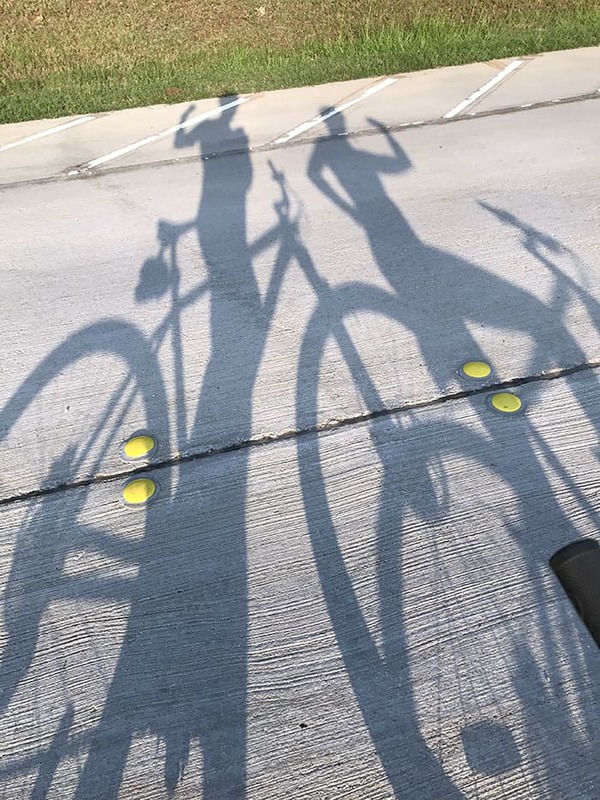 One thing is clear – bicycling is the BEST way to see the most interesting sights, and the exercise always leads us to the best ice cream shop in town! The photograph above was taken about a year ago by our son, Zach. 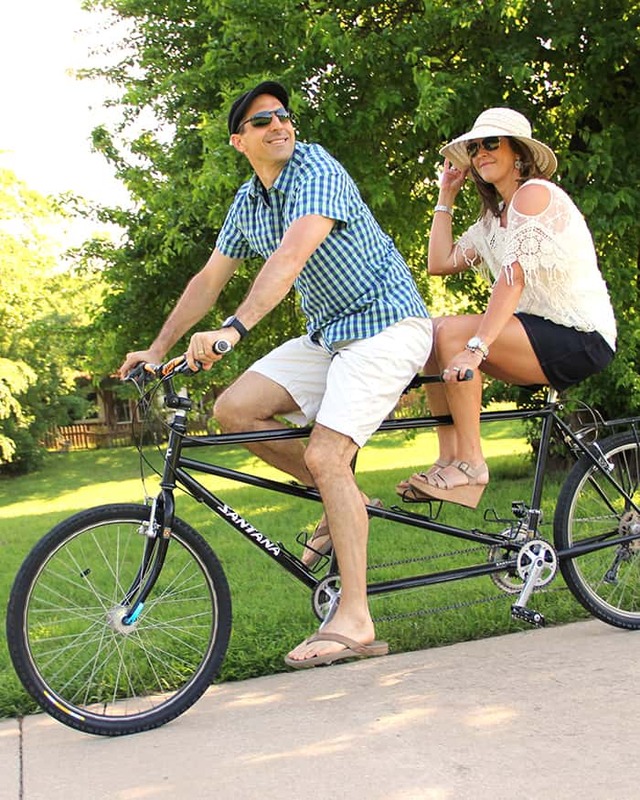 We don’t normally ride a tandem bike, but had the opportunity for our photo shoot, thanks to a friend of Mike’s. 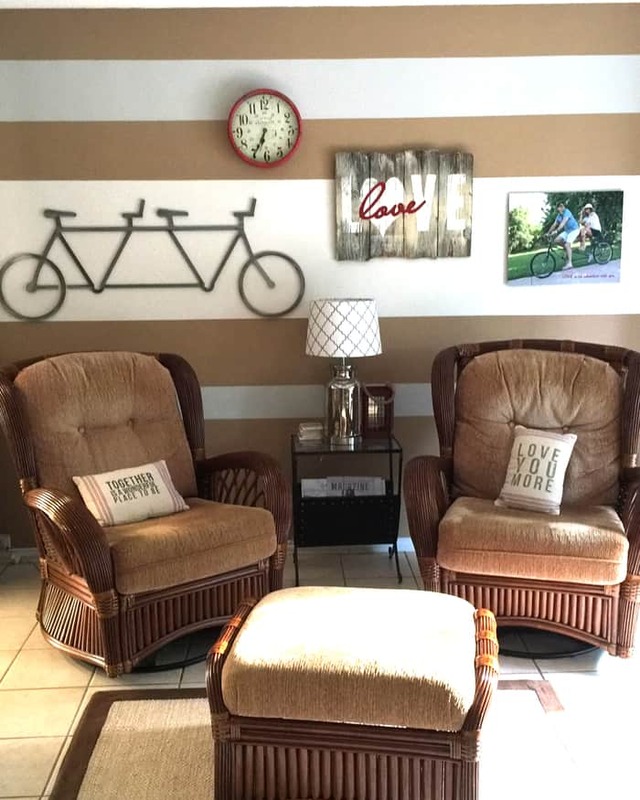 I was decorating a wall in our sunroom (see the last picture below) and decided we needed to make it all about our biking adventures together. 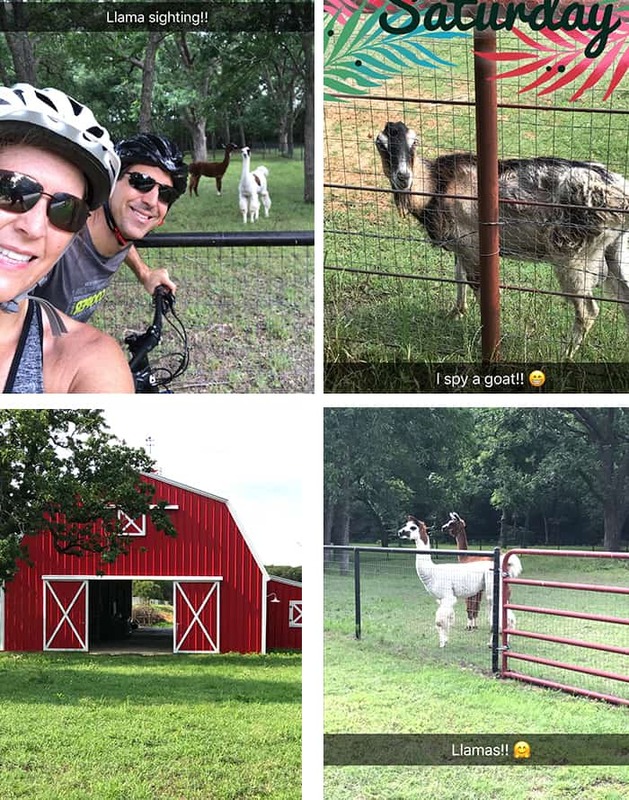 On our rides in the Texas country, we are often entertained by farm animals, including the llamas, goats, cows and horses along the way. We also love the bright red barn you see pictured below. It was part of a pretty large ranch, and it sure is an attention grabber because we gawk at it every time we ride past it. We’re pretty lucky to have an amazing area to ride so close to our home. We just hop on the trails, go through a few neighborhoods, and we’re in the country. For our 25th wedding anniversary in June of 2014, Mike and I went to San Francisco for five days. It was actually the first time we had both been away from the kids, so it was BIG. We’ve never had family close by to take care of the boys, and since they were old enough, we did it. This was the trip to start our biking adventures, and it was truly a memorable one. 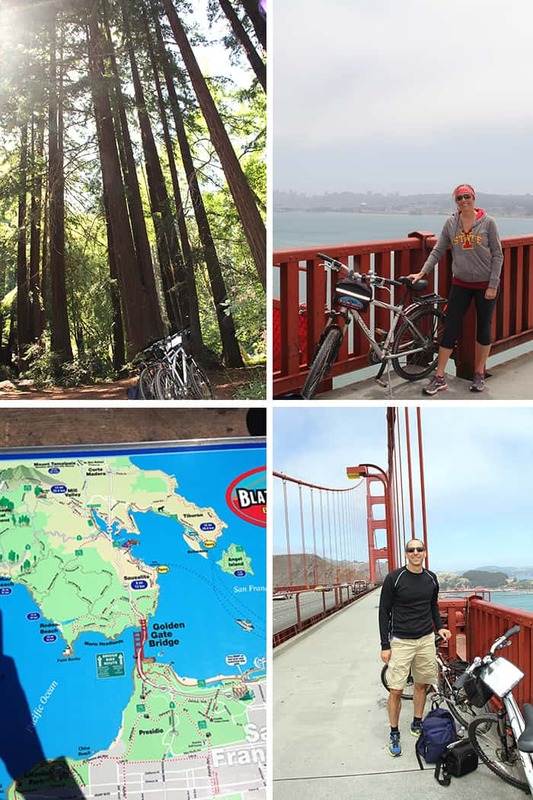 We rented bikes from Blazing Saddles, grabbed a map, and headed out across the Golden Gate Bridge to Sausalito. Riding across the Golden Gate Bridge was pretty neat, even though there were hundreds of tourists making their way across it too. The funny part was that a lot of bikers looked like it was their first time riding a bike EVER. From there, we continued on to Tiburon (home of the late great Robin Williams). This was the difficult part of our journey because we had no idea how far we had left to pedal. Let’s just say we (okay, maybe just me) were extremely worn out by the time we made it to the ferry. We grabbed some well-deserved gelato in Tiburon, and hopped aboard – along with our bikes. Later on that summer, our family vacationed in the Smoky Mountains of Tennessee. We stayed at Cloud Dancer II, our friends’ amazing cabin in the mountains. 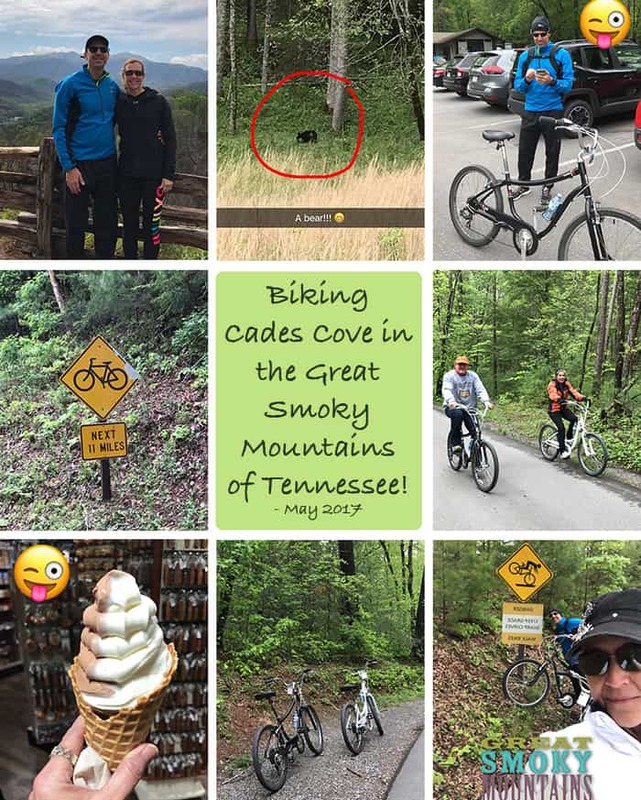 The four of us kept busy – zip-lining, hiking, shopping, golfing, and mountain biking. The boys weren’t interested in biking with us, so Mike and I did that part alone. The mountain biking was an actual course and was a very, VERY difficult ride. I think I hyper-ventilated a couple of times, but I pushed myself and called it a good day. Meanwhile, Mike continued on the course a FEW more times and burned another 1,000 calories or so, while I was trying to recover. No kidding. It was a really busy summer of 2014. Zach and I headed to Colorado to see family in late summer, while Mike and Josh stuck to baseball playing. My sisters all did the walking/hiking thing, but due to my chronic feet issues, I stuck to the bike. 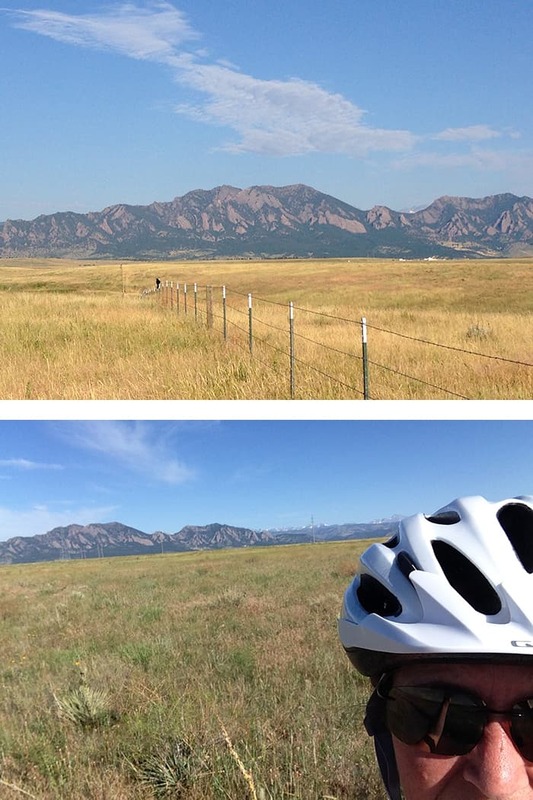 My Colorado sis, Jackie, borrowed a mountain bike from a friend for me to ride the trails. The summer of 2015 was a pretty active one as well. The four of us spent several days in Hilton Head, SC, and then several more in the Smoky Mountains. 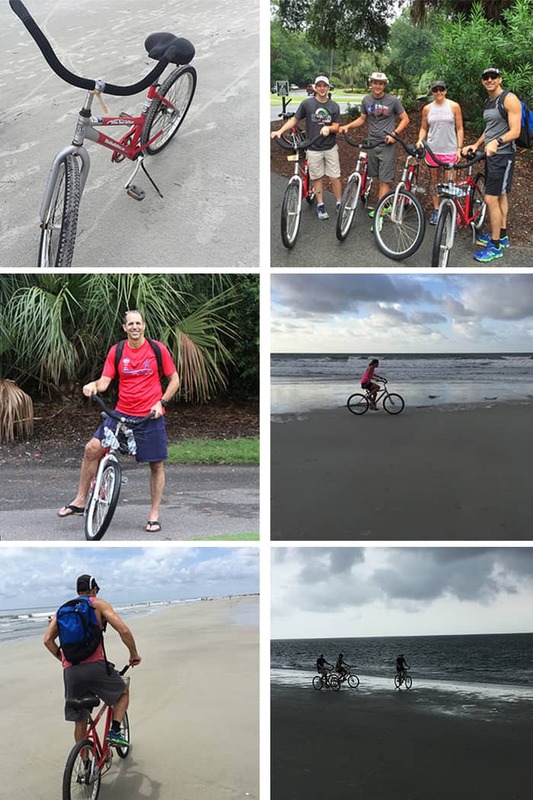 We loved our Hilton Head beach bikes and decided it was a better way to get around than driving. The island is extremely busy during the summer months, but it is made for bicycling – with trails and sidewalks everywhere, not to mention the white sandy beaches. The first bike ride was on the beach, and when we were several miles down from our resort, the storms came roaring in with gusto. We turned around and headed back, but against my better judgement, fought high winds, heavy rain, and lightning. It was amazing how fast the beaches cleared as we were practically the only (stupid) tourists around. Back to the Smoky Mountains we go! Mike and I rode Cades Cove on this trip to Tennessee. 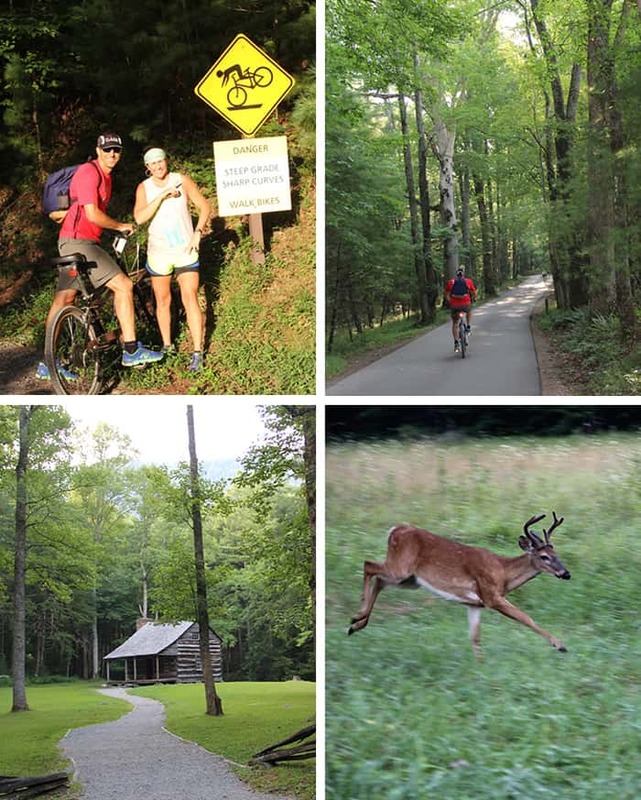 Cades Cove is an isolated valley in the national park, and so the 11 mile bike ride has slow rolling hills instead of long mountain climbs. During the summer months, they close down the road (only on certain days and for about two hours each) to cars so that bikers can ride the loop without traffic. We were surprised how many people were riding, but it was great fun and the views were awesome. We saw several deer on our adventure, and toured some of the old homesteads that give this area it’s historical charm. My first international trip was to Spain and Portugal in February of 2016. We visited the cities of Madrid, Lisbon, and Barcelona. 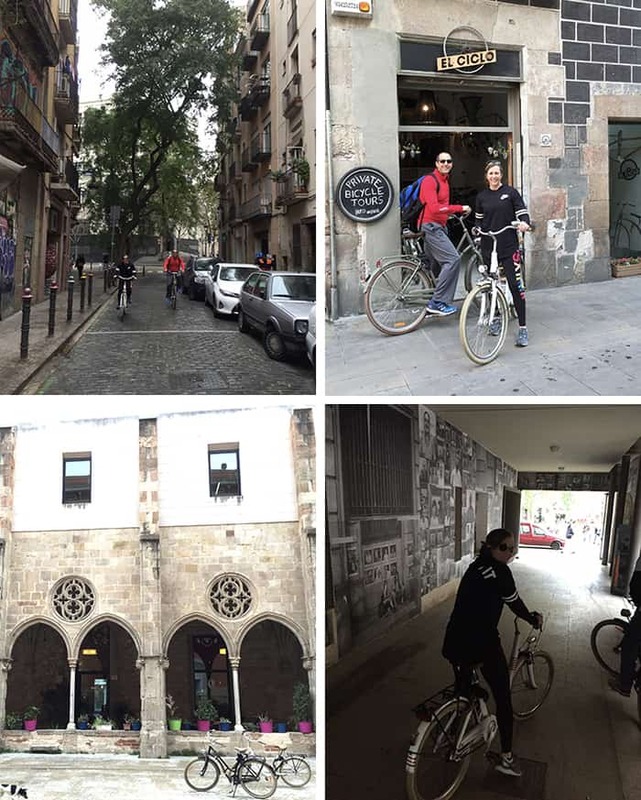 During our stay in Barcelona, we toured the city via a private bike tour one day. Although Florent was very hard to understand, he did a great job showing us the city from this perspective. We started at Port Veil, along the waterfront, and pedaled by the Parliament, the bull-fighting arena, the Arc de Triumph, the Sagrada Familia (one of the most famous landmarks in Barcelona), ending in the quaint and narrow streets of El Born. After our 3 1/2 hour bike ride, we quickly found a bar specializing in Sangria, and settled in for a couple of hours. Our family bike ride through Central Park, in July of 2016, was a hot one. 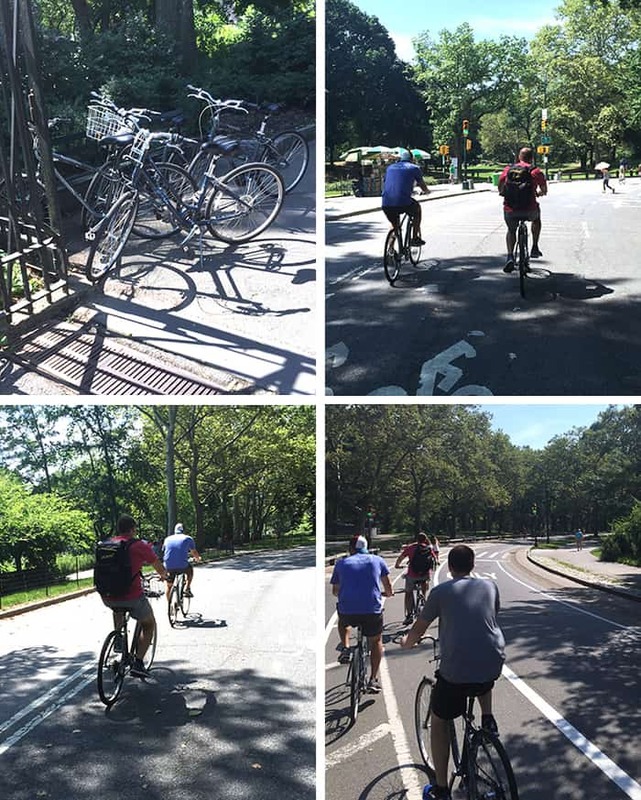 We happened to be visiting NYC during a very warm weather streak, so our ride was not as fun as we had hoped. We also were very close to getting in a collision, as a serious biking accident happened right in front of Mike and Zach as they were riding. Luckily, there were people with a medical background available to help immediately. After our ride, we hustled over to Carnegie Deli for a VERY large sandwich and the best cheesecake in town! 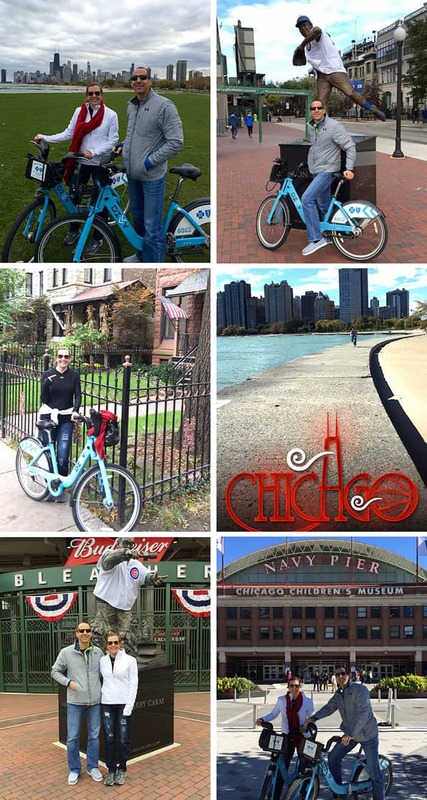 Chicago was part of my 50th birthday celebration, and instead of shopping for hours on Michigan Avenue, we rented Divvy Bikes and explored the city on two of the three days. Much of our riding was along Lake Shore Drive, which was beautiful in every direction we looked. We took a few detours to Lincoln Park, Wrigleyville (during the Cubs playoff series against the Dodgers), and Loyola University. The second day of riding ended with the largest sundae on the Ghirardelli’s menu – a Salted Caramel Brownie Sunday for two. And we licked the bowl! One of the shorter rides we’ve done while traveling was in Kauai this past January. 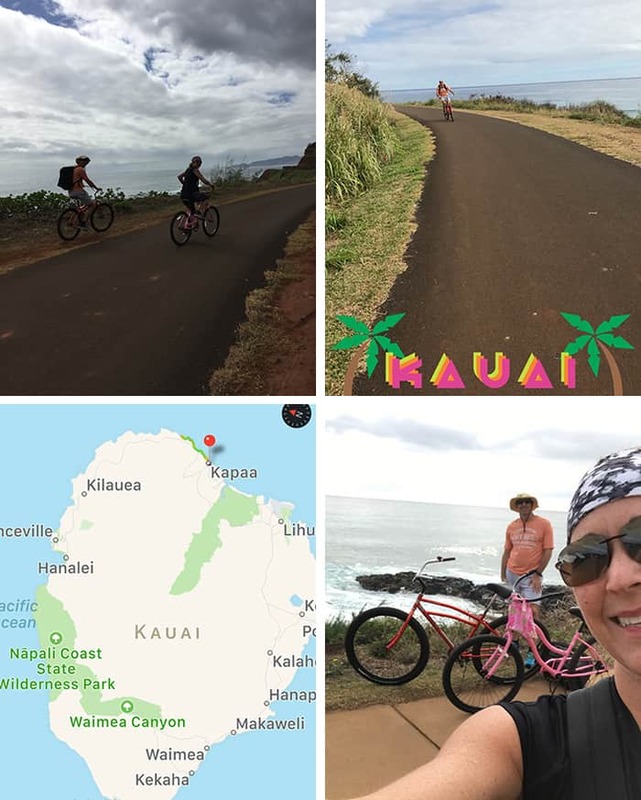 We went to both Kauai and Maui, as part of our 50th birthday celebrations, and made it our mission to find somewhere to go biking. After renting two bikes in Kapa’a, we rode a 9 mile path along the northern coast and enjoyed watching the giant waves crash into the shore. There were perfect photo opportunities in every direction we turned, so we did a lot of hopping off of our bikes to capture those moments through photography. We were sad that the path wasn’t longer, but that left us with more time to drive up to the Waimea Canyon (a mini version of the Grand Canyon, but quite spectacular). Our most recent bike riding adventure was in May of this year. We met Mike’s dad and his wife, Robin, in the Smoky Mountains for a little R&R. Due to extremely high winds, Cades Cove was closed every day but our final one in the area. We definitely wanted to show our guests this part of the national park, so we bundled up in layers and hit the trail. As you can see, our many biking adventures above inspired my sunroom wall. I love this tradition and hope that we can keep it up as time goes on, God willing. This makes me feel like I’m missing out by not being a cyclist! SO COOL!! This is fantastic Sue! 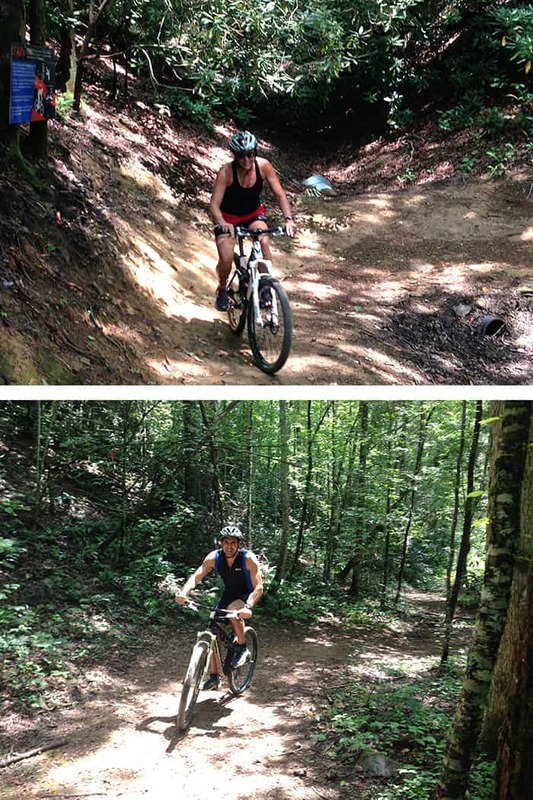 You’ve biked some pretty amazing and aggressive trails.